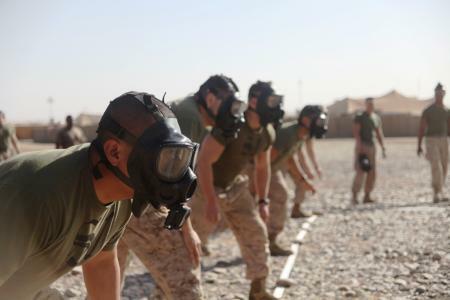 Why are these Marines wearing gas masks? Is it a biological attack? Chemical warfare? A skunk on the loose? First Lt. John Yacos, the motor transport officer-in-charge with 3rd Light Armored Reconnaissance Battalion, throws a ball during combat dodgeball Jan. 30. Nope. Turns out they’re just playing dodgeball in Afghanistan. That’s the story out of Combat Outpost Payne, home to 3rd Light Armored Reconnaissance Battalion, out of Twentynine Palms, Calif. It’s among the Corps’ southernmost outposts in Helmand province, a hub where Marines patrolling the deserts leading to Pakistan in Light Armored Vehicles catch a break. Marines and sailors with 3rd Light Armored Reconnaissance Battalion, 1st Marine Division (Forward), played “combat dodge ball” during the weekly “Payne Games,” Jan. 30. Six teams competed in the dodge ball game, where wearing a gas mask was not an option. 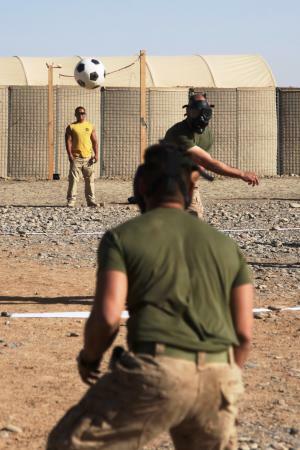 The unit conducted similar weekly games last year in Iraq, although the competitions stretch far beyond dodgeball.